This 5150 was made in mid 1982, as best I can tell. It has the October 1981 ROM date. It came with a Davong Systems hard drive, with an external power supply. 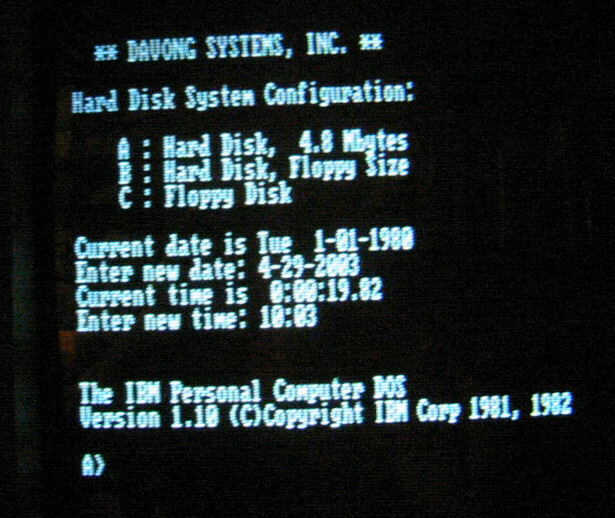 The hard drive controller is designed to work with IBM PC-DOS 1.00 or 1.10. Amazingly, I found a manual and driver disk for the Davong setup on ebay. I was able to format the drive, and make a boot floppy for it. 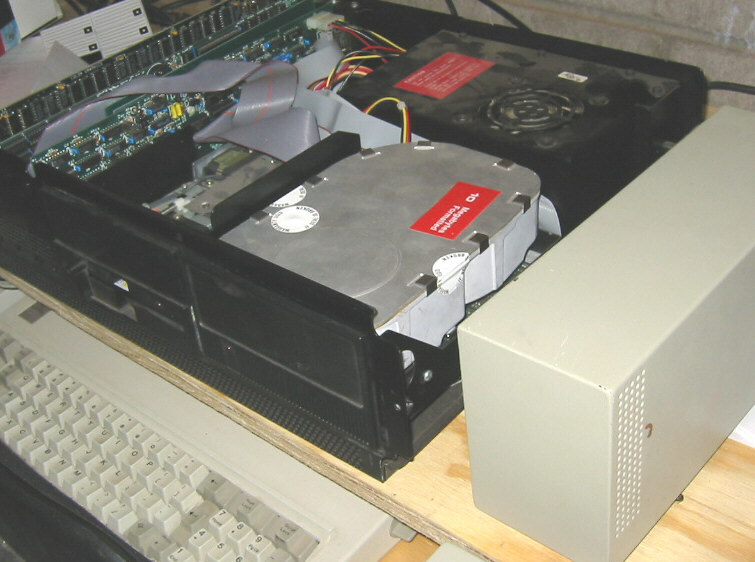 The system boots from a special floppy with the IBM hidden system files, and a special command.com file and special format and other utilities. The boot screen shows how it has the hard drive as A: and B: and the floppy drive becomes C:. Very hard to get used to! but that's how they did things back then, before the PC XT and DOS 2.00 came along in 1983. The B: partition is floppy sized so that one can use the diskcopy command to copy a floppy disk to the hard drive, or vice-versa. There are no such things as subdirectories on the hard drive, so all the files are in the main partition. This was ok when there wasn't much software available that would even run from a hard drive, but DOS 2.00 did fix this limitation. Note that at this time, CP/M had 16 "user areas" on each drive. They are inconvenient to use, but do provide separate areas for different files. Hardware note: the black power supply, which is original IBM. Later models used dull chrome plated power supplies. The PC has only five card slots, on one inch centers. The XT has eight slots, on 0.8 inch centers. Most of the cards in this early PC were designed before the XT was introduced, and are made with what we now consider to be very wide (and painted black) brackets, which will not fit in an XT case. 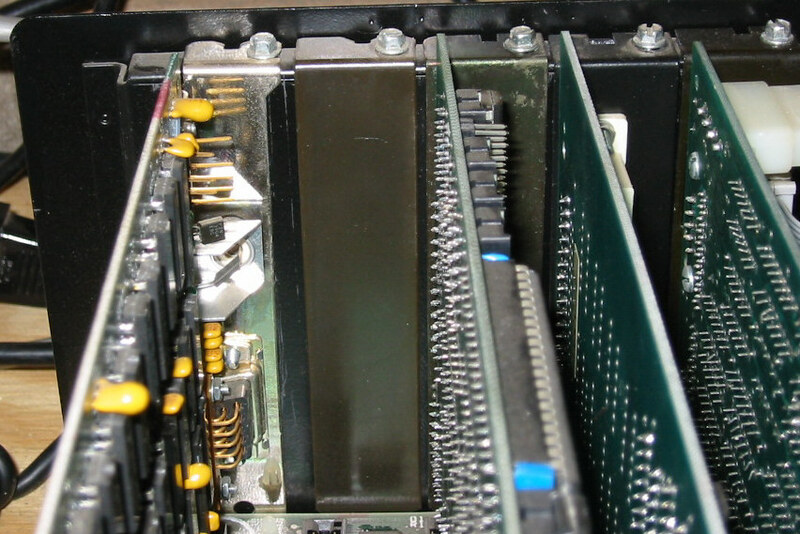 The video card, which is the only IBM card in this PC, has a narrow bracket. This particular Color Graphics card was made in early 1983, judging by the chip date codes. Apparently IBM knew the XT design plans at that time, but didn't share with all the aftermarket adapter card makers. Note also that there is no screw hole in the top rear corner of the case; the early PCs only had two screws instead of five to hold on the cover. The floppy drive card is an aftermarket part, similar in size and shape to the IBM card, but with different appearing circuitry, including a little add-on daughter card. The card is connected to a non-IBM half height floppy drive, as the rest of the industry had gone to half height drives by 1982, but IBM didn't switch till the AT came out in 1984, and still provided full height drives in PC and XT machines for a year or two longer. The Davong hard drive controller card has an external power input connection, and a standard four pin power connector on the card to feed the hard drive, visible in the top right corner of the picture. This multi-function card, with only one row of RAM chips, adds another 64kb memory, doubling what's on the system board, for a total of 128kb. The early 5150s could handle 256kb, from what I've read about them. I have no reason to add more memory to this unit, as 128k should be all that I need to run any programs that will run in PC-DOS 1.10. It would be nice to get the clock working, though, and I suspect it just needs a new battery and the software installed to do that. 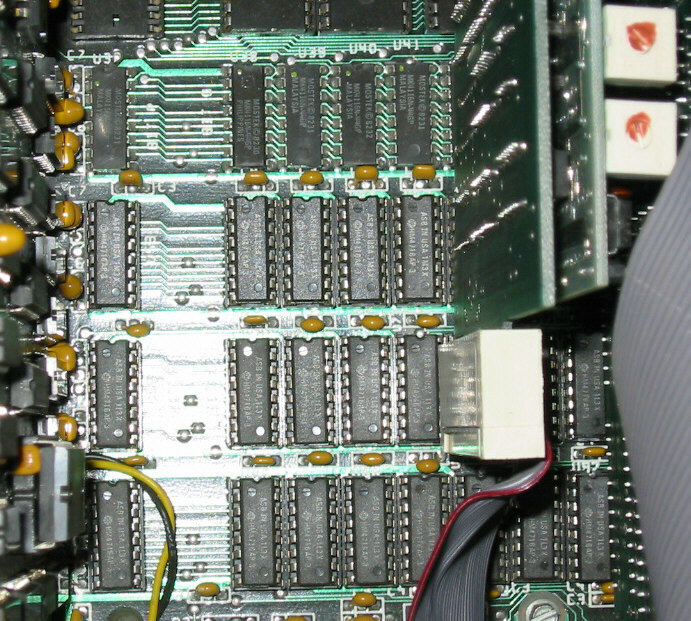 Notice that this card has overhang behind the ISA edge connection, so it won't fit in a 16 bit slot--which would not be a problem for two more years after this card was made. But the AT came with all the goodies that this card provided, making this type of card obsolete. You can view the file list for IBM PC-DOS version 1.00 and version 1.10. The hidden system files are not shown in these listings. There is a persistent urban legend that PC-DOS version 1.00 was never released. I don't believe it.